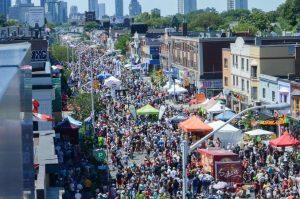 Taste of The Danforth Festival is back! They will celebrate the 24th anniversary of Canada’s largest street Festival (approximately 1.65 million attendees) as well as Canada & Ontario’s 150th birthday on Friday August 11th, Saturday August 12th, and Sunday August 13th. Attractions include a Greek Stage, Celebrity Stage, and Showcase Stage programmed by NXNE, as well as a kids’ zone, sports zone, and of course, a multitude of drool inducing food options. To eat this year, attendees can look forward to restaurateurs along The Danforth offering “Tasting Menus” priced at $6 or less. To top it off, the Festival is all about the spirit of giving back – Constantine Voidonicolas, Chair of the Greektown Danforth BIA, confirmed that once again all proceeds from the Festival go to supporting a number of charities.